Alysia Ramirez, a fourth-grader at Schultz Elementary in Delaware, does a “check-up” on a stuffed animal brought to her during the rescue mission event Wednesday. The rescue mission is the third part of a superhero course designed by physical education teacher Kathy Horner to help students build strength and learn about health and teamwork. Kindergartners at Schultz Elementary School search through debris from an “earthquake” Wednesday to find trapped stuffed animals and get them to a doctor. The students were assisted by City of Delaware firefighters and School Resource Officer Larry Lucas. Kindergarten students at Schultz Elementary School in Delaware will be completing their superhero training this week after an exercise to “rescue” puppies and kittens from an earthquake. The “earthquake” did not measure on the Richter Scale but did leave the gym at Schultz filled with traffic cones, wrestling mats and boxes, and left 50 “puppies” and “kittens,” played by stuffed animals, trapped under the debris. According to physical education teacher Kathy Horner, kindergartners at Schultz have been doing “superhero training” for the last three weeks and underwent an exercise boot camp and a nutrition lesson about healthy food and negative foods. The superhero course is designed help students build strength and learn about health and teamwork. The rescue mission was the last of the superhero lessons, and students had to search through the debris with their partner, find the stuffed animals, and then one partner would go get an “ambulance,” played by a scooter. One partner would comfort the stuffed animal, while the other partner pulled them to the hospital where fourth-graders with stethoscopes would “check out” the animals and make sure they were okay. On hand to help the students were three firefighters from the City of Delaware Fire Department and School Resource Officer Larry Lucas. The volunteers teamed up with students to lift heavier objects and help find the stuffed animals. Lucas said the exercise showed the students teamwork in action. Lucas said students get a sense of pride out of finding the animals, especially the student who located the final animal and earned applause from his classmates. After all the animals were rescued, Horner told students they had earn their superhero titles and said they will be awarded superhero capes at a ceremony next Thursday. Horner said it was important that students kept trying and not give up, even when there was only one animal left. Horner said she wanted the exercise to promote teamwork, and she added the students have a superhero chant that encourages them to always try and never give up. Before heading back to class, the students thanked the firefighters who helped them and Officer Lucas. Horner told the students that firefighters and police are “real-life superheroes” who will always help when they can. 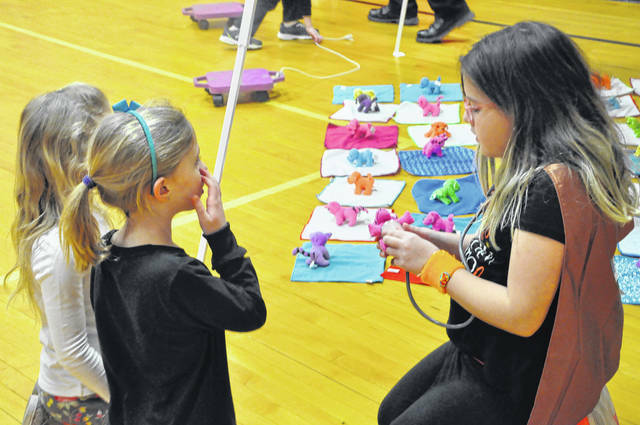 https://www.delgazette.com/wp-content/uploads/sites/40/2018/04/web1_DSC_1457.jpgAlysia Ramirez, a fourth-grader at Schultz Elementary in Delaware, does a “check-up” on a stuffed animal brought to her during the rescue mission event Wednesday. The rescue mission is the third part of a superhero course designed by physical education teacher Kathy Horner to help students build strength and learn about health and teamwork. 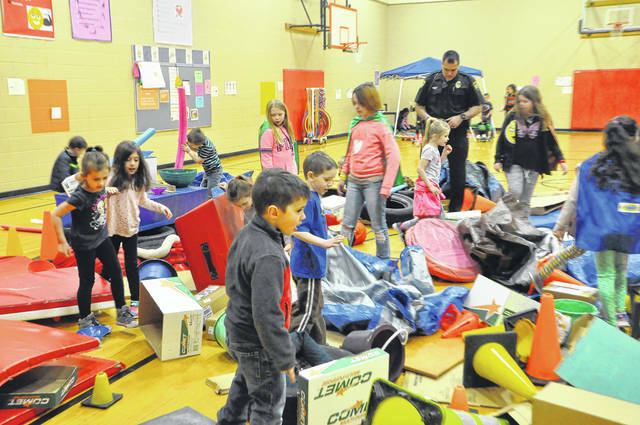 https://www.delgazette.com/wp-content/uploads/sites/40/2018/04/web1_DSC_1455.jpgKindergartners at Schultz Elementary School search through debris from an “earthquake” Wednesday to find trapped stuffed animals and get them to a doctor. The students were assisted by City of Delaware firefighters and School Resource Officer Larry Lucas.